Decentering Relational Theory: A Comparative Critique invites relational theorists to contemplate the influence, overlaps, and relationship between relational theory and other perspectives. Self-critique was the focus of De-Idealizing Relational Theory. 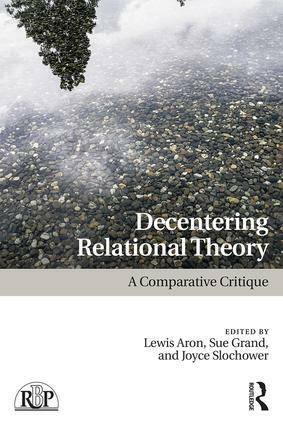 Decentering Relational Theory pushes critique in a different direction by explicitly engaging the questions of theoretical and clinical overlap – and lack thereof – with writers from other psychoanalytic orientations. In part, this comparison involves critique, but in part, it does not. It addresses issues of influence, both bidirectional and unidimensional. Our authors took up this challenge in different ways. Like our authors in De-Idealizing, writers who contributed to Decentering were asked to move beyond their own perspective without stereotyping alternate perspectives. Instead, they seek to expand our understanding of the convergences and divergences between different relational perspectives and those of other theories. Whether to locate relational thought in a broader theoretical envelope, make links to other theories, address critiques leveled at us, or push relational thinking forward, our contributors thought outside the box. The kinds of comparisons they were asked to make were challenging. We are grateful to them for having taken up this challenge. Decentering Relational Theory: A Comparative Critique will appeal to psychoanalysts and psychoanalytic psychotherapists across the theoretical spectrum. Don’t throw out the baby! Does an anti-development tilt still exist in Relational psychoanalysis?